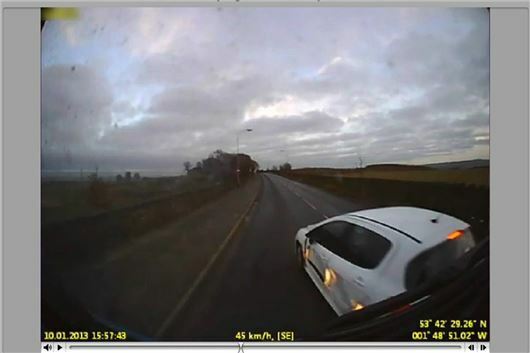 A SmartWitness camera caught this extreme example of a misjudged overtake, happily landing the blame on the driver of the white Peugeot 308. It illustrates how the totally unexpected can be recorded by an evidential car camera and absolves the driver of the SmartWitness equipped truck from any blame. In this case, the driver of the white 308 did at least pull over after the incident. He could easily have been prosecuted for dangerous driving. Near misses like this are captured by SmartWitness incident cameras every day. It's why SmartWitness incident cameras are increasingly being used by hauliers and fleet managers to improve safety and slash insurance premiums. They not only record the incident footage, time and GPS location, but can also be made tamper proof by fitting a lockable SD slot cover. SmartWitness managing director Simon Marsh said the footage shows again the importance of driver behaviour in keeping Britian's roads safe. Mr Marsh said: "I've never seen a closer head-on near-miss caught on our cameras." "We encourage and train our clients to use our cameras to educate their own drivers as well as to guard against the recklessness and sometimes false allegations of other drivers. "Clearly the HGV driver in this case was blameless but it's amazing how effective the footage is in improving driver behaviour. "We find clients are now more than ever using footage to train drivers and improve road safety." SmartWitness has introduced a new innovation to its products, Enhanced Driver Report (EDR) which can gauge the competence of driver over a month's worth of driving data. Marsh said: "They are given a grading from an A to an E, based on a month's worth of driving. Obviously fleet managers will know who their best drivers are but it will certainly help find drivers that are in need of retraining. "But the cameras make sure that drivers are constantly vigilant when they are out on the roads on their own." Marsh previously owned a transport company with 200 vehicles and tragically lost two of his employees in separate incidents in 2005/6. It is one of the reasons he so passionate about road safety and improving driver behaviour. Marsh said: "The key message to all drivers is to avoid events that will lead to incidents in the first place - and the best way to do that is to modify a driver's behaviour. SmartWitness cameras provide Vehicle Journey Records (VJR) and not just Event Journey Records (EJR)." "The cameras capture everything that happens once the ignition is switched on and can easily show drivers and fleet managers where mistakes are being made." Haulier Wrings Transport, based in Hallen, South Gloucestershire, saved £20,000 on its insurance after fitting SmartWitness cameras in its fleet. More importantly, its accident rate was cut by 50%. SmartWitness won this year the prestigious Best Fleet Safety Product awarded by Road Safety Charity BRAKE. Its cameras are officially approved by Transport For London.